Emmanuel Church was formed on October 17, 1927 with the congregation meeting in a storefront building in Morristown, NJ. 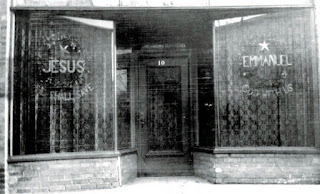 Two lighted signs were placed in the windows of the storefront which read: "Jesus, He Shall Save" and "Emmanuel God With Us." Church officials were elected by the congregation and the first pastor was installed. At that time, without the use of a horse or a car, the pastor would walk up and down the hills of Morris County in all types of weather conditions to visit and minister to members. Later on the church bought a house at 33 Maple Avenue in Morristown and converted it to a church and manse. In 1970 they moved to Whippany, at the corner of Park Avenue and Whippany Road until 2015. Why am I so sad? You see I grew up in Whippany, my wife and I were married in this church in 1992, my children were baptized in this building, and I was a member and a ruling elder for many years. Sadly there are condominiums presently being built where this wonderful church facility stood. I can not get my mind around the idea that Emmanuel Church no longer exists. I can not accept that its history will be lost and it's pastors and people - not remembered. I feel as if this online presence is a small tribute and a place holder for a future church work. I do request your prayers. I do not believe God is done with Whippany or the Morristown area. I pray that God would once again display His glory and restore what has been lost. I would like the testimony to be, we were "Persecuted, but not forsaken; cast down, but not destroyed..."
I would ask if anyone has a like desire, to contact me via email - that we can meet together and pray for the return of this once beloved church in Whippany.